This 7-week e-mail course will show you the essential techniques that every fiction writer NEEDS to know. You have stories inside you, waiting to come out. Express your unique imagination and write fiction that people will care about. The best fiction can create intense experiences for the reader. It makes people cry and laugh out loud, stay up all night reading. It lets them escape their daily routine and live other lives. It changes the way they see the world and becomes a part of their memories. You can learn how to write fiction that does all this. Essentials of Fiction puts the tools in your hands. You know that wonderful "lost in the book" feeling, as if you're living the story instead of just reading it? Discover an easy shortcut to create this feeling for your reader! Have you ever read a book with characters who felt like real people to you -- characters who keep you company, become your friends or enemies or even become part of yourself? Learn how to create characters who come alive. Week 3: Plot Structure Find out how to give a story its shape -- and what keeps readers turning pages. In this lesson, you'll go step-by-step through the process of outlining a story plot. "Show, don't tell" is common advice in creative writing classrooms. Find out what this advice REALLY means (hint: it DOESN'T mean add more description!). Learn how to write scenes that make readers feel like they're experiencing your story first-hand. Learn how to choose the right "camera angle" for your story and use it to pull readers into your scenes. Give each of your characters a unique voice that the reader can "hear" on the page. Build a three-dimensional environment where your characters can live and where the events of your story can happen. Control your readers' imaginations so that they'll picture the story the way you want them to. Essentials of Fiction Writing is taught by Nancy Strauss, the Online Courses Director at Creative Writing Now. Nancy has an M.F.A. in Creative Writing from the University of Michigan, where she has also taught creative and expository writing. *Please note that feedback on your writing assignments is not included in this course, which has been designed for self-study. While teachers will be available to answer general questions, they will not be able to read or comment on your creative writing. "Thanks for this awesome learning opportunity." 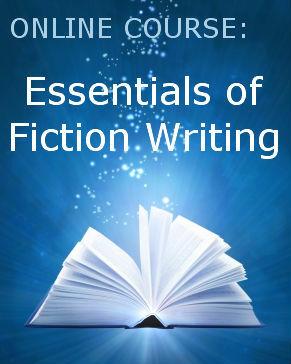 Essentials of Fiction Writing- Includes 7 e-mail lessons, weekly assignments, the chance to publish on the course blog, and the chance to ask a teacher general questions. Feedback on assignments is currently not available for this course. A: The course is focused on fiction-writing (short stories or novels). If you are mainly interested in writing essays, articles, poetry, or another genre, this course may not be right for you.